We are almost done harvesting milo for grain in Thomas County. This is the first season all of us have dealt with sugarcane aphids from beginning to end. The majority of fields in the county have been treated 4 times for aphids. This does seem like a lot of sprays; however, in these fields, yield reports are good. In these fields, SCA was spotted early and treated at or below threshold. There was a few fields that were treated late, according to threshold. SCA reached the top of the plant before spraying. A couple of weeks later, the lower leaves completely desiccated due to aphid pressure. These yields are much lower than average. Other reports are were volume is high, 17%-19% moisture, test weight is low. Could this be from SCA? UGA Extension Entomologist Dr. David Buntin says, yes, this can be the result of SCA. However, test weight be also be related to wet and dry cycles. And this season will certainly be marked by wet and dry cycles. Another issue we have noticed are small heads and large heads. Dr. Buntin says when heads are in two or three different stages of growth, this is result of SCA. SCA don’t have huge phytotoxic effect of feeding, but lots of feeding over time delays heads emerging. At this stage, we still need to check heads for aphids. Mississippi saw a 20% yield reduction when aphids persisted into the heads. Here are some more slide from UGA Extension Economist Dr. Nathan Smith on PLC Payments. Here are some slides by UGA Extension Economist Dr. Nathan Smith on our current peanut situation. Thanks to Seminole County Agent Rome Ethredge for organizing these slides for use. Do you need recertification credits? Not certain? Find out here at the Kelly Solutions website. Don’t miss the opportunity to earn 5 hours of commercial pesticide applicator credits good in 15 categories. Also…Categories 22, 25, 32, 35, 36, 37, 38 or 39. Also earn five hours of International Society of Arboriculture (ISA) Credit. Cost is $55 until Thursday, October 15 and $65 afterwards. Lunch & breaks are sponsored by FIS Outdoor, Inc. Most minor foliar disease like this infect the leaves a month or two prior to symptom expression. Dr. Brenneman suggests use of a strobilurin or a DMI/strobilurin mix like Absolute or Quadris Top when conditions favor infection (usually prolonged wet conditions). Even if a grower has used these materials, their timing may have been off enough to allow infection. Once you see the symptoms its too late to do anything about it. But, even when terminal die-back occurs earlier in the season we have not seen any long-term damage to the trees and no effect on nut quality so don’t get too alarmed when you see this problem. 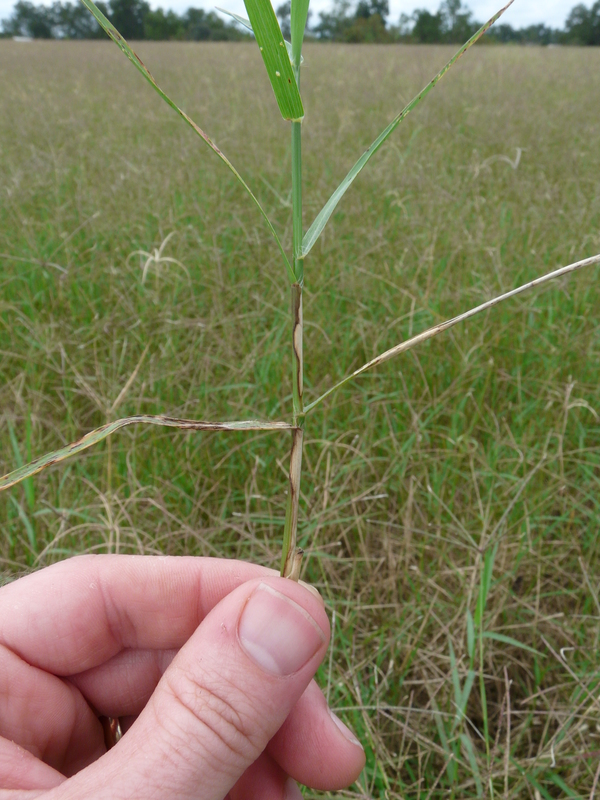 Here is a Tift 85 pasture that has been cut twice so far and is showing symtpoms down on the leaves and lower down the stem. We are seeing both leaf blight (helminthosproium) and leaf rust. These issues we commonly see in late summer when weather is warm, usually between 75 degrees F and 90 degrees F, and with high relative humidity. Bermudagrass leaf spot is caused by a fungus from the genus Helminthosporium, and the disease has been informally called Helminthosporium leaf spot, Helminthosporium leaf blotch, or Leaf Blight. Leaf lesions of helminthosporium are irregularly shaped and brownish green to black in color. We may see it in irregular patches. Leaf spots are more numerous near the collar of the leaf blade. Leaf rust or Puccinia disease has similar impacts as Helminthosporium. We will also see red to orange lesions can on leaf and stem. Look for a raised area or blister which is the rust postules like we see in wheat and corn. Rubbing your finger over the leaf will leave a rusty color. Management is strictly avoidance. Coastal, Tift 44, and Tift 85 have some level of resistance while Alicia is extremely susceptible. But even less susceptible varieties are infected with leaf spot when potassium is low. Most reported leaf spot cases are directly related to low soil potash. Nutrients are removed from bermuda hay fields in about a 4-1-3 ratio of N, P2O5, and K2O with harvest. We need 75 percent as much potash as nitrogen applied each season. Split applications of K are better in sandy soils. With helminthosporium, removing the inoculant is also recommended. In addition to tying up nutrients, thatch holds water and reduces air circulation. This is a conducive environment for inoculum. The only practical way to reduce thatch is burning in spring before green-up. 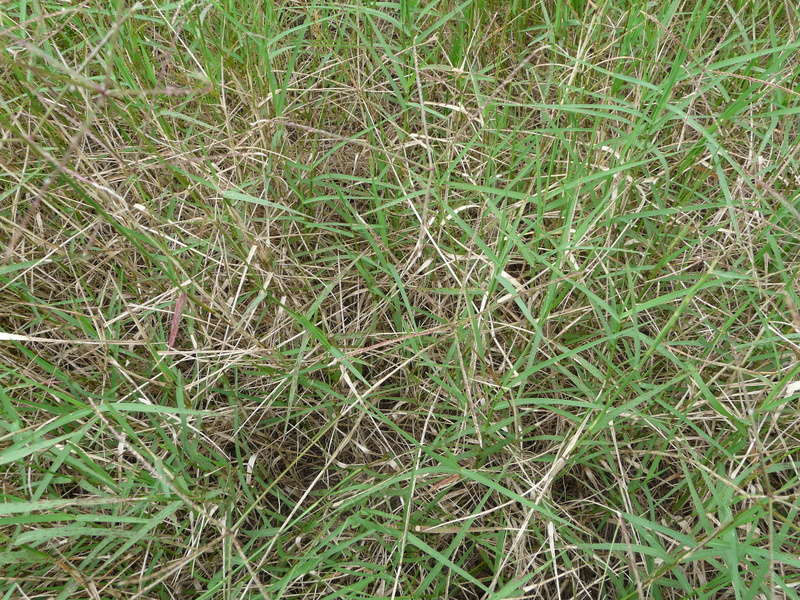 Visit Leafspot Diagnosis and Management in Bermudagrass Forages for more information.